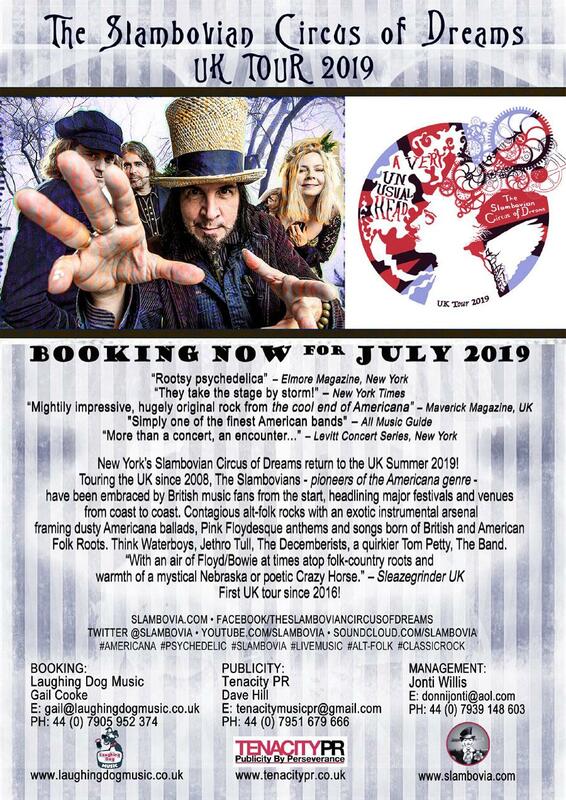 New York City based band The Slambovian Circus of Dreams are touring the UK in the first 2 weeks of July 2019 and we are delighted that they will be visiting the Black Dyke Mill Heritage Venue on Thursday 4th July 2019. Starting off as the almost heavy metal Ancestors in the 90’s the band have taken all that is good in folk, country and Americana with a twist of Pink Floyd flavouring. The Slambovians have melded their own unique sound that is at once familiar yet almost impossible to pigeon hole. The Slambovian Circus of Dreams have such an eclectic live stage presence that once seen, always hooked. Rubbing regular shoulders with some of the icons of American music the band have got some serious endorsees. Garth Hudson of The Band is a committed Slambovian disciple and fan describing frontman Joziah Longo as “An awesome songwriter”. Well known as a touring band throughout the North Eastern States, the popularity of The Slambovian Circus of Dreams have earned them a virtual residency at many of the larger folk festivals. Support comes from The Hayes Sisters whose intuitive harmonies and songwriting are not to be missed. A great evening of the best music around in our unique venue.